I am in the process of building the table out of some steel, the table top is about 4' square. 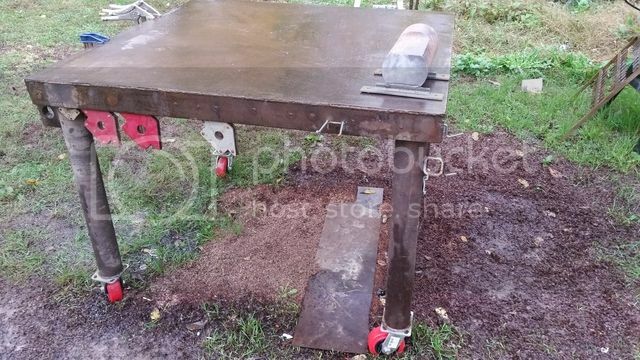 I was wondering what features that you have or would like to have on a good work/welding table? 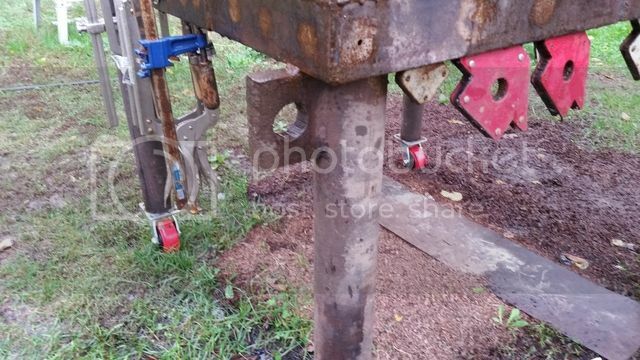 On my smaller welding table I have a rod welded to it like a handle that I hang my C clamps on. I also have a vise to one side. 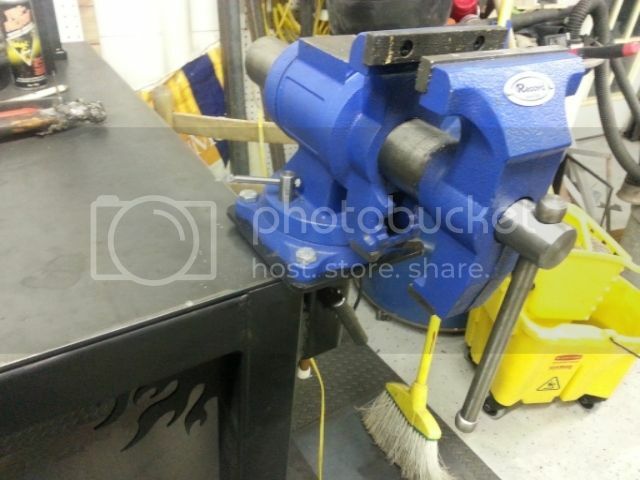 If you want to keep your table space free you can weld a 2" hitch receiver to the underside and mount your vice to it making it portable and only in place when you need it. 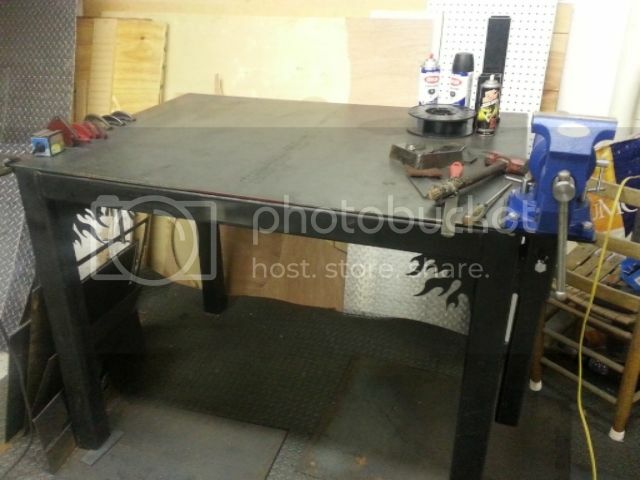 I have a big 3/8" table on casters that I use for lay out work only. I agree with k.a.m. on the idea of a removable vise. A vise is a great tool to have on the table "when" you need it, but on some projects it can really be in the way if its bolted down solid. Places to hang clamps and levels are a must, I always put them on the sides of the table that way your not knee or waist bumping them all the time on your primary work side. I also try and place the hangers for the tools recessed in a bit so the ends of the hangers or the tools are not as bad of a body grabber as your working/walking around the table. I always put a couple dedicated lugs down low on the table for a ground clamp. I try to keep my ground clamp on the ground (no pun intended) as much as possible so it is not so much of a trip hazard. 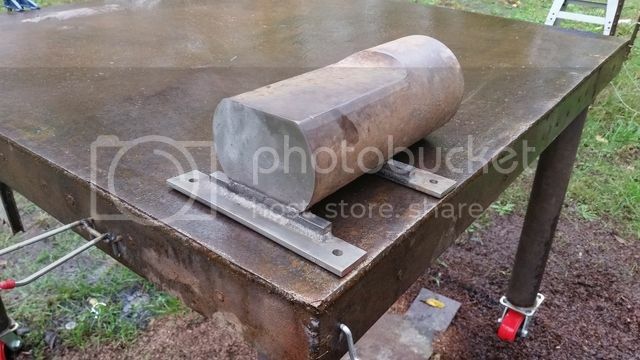 I use a short drop of tubing or a small piece of pipe and weld a couple on the legs of a welding table where a MIG gun can be hung in to keep it off the table if working, or the floor, and it makes for easy access to it when your ready to use it. May seem like a no brainer, but make sure you have overlap on the table that will allow you to use C clamps properly. No legs or framework right out to the edges. Thru holes on the surface can come in handy as well, tapped or not. Making sure the corners are as square as possible, and the surface is as flat as possible will help setting up projects in the future. Built a few for friends with dedicated removable angle on one side you can use as a brake / clamp / square. It was 3x3 angle ... nice for clamping vertical pieces to. power strip mounted under table on one leg. If you have another table that this table may be near make it the same height never know when you will need that extra space. For welding on stuff that has bearings, pivot points, nuts and bolts, I do that welding work on a wood table and ground the part so I don't arc the bearings, pivot points, nuts and bolts. Yes you can mess them up. And put it on locking castors, makes it easy to move when you need to. k.a.m: I like the removable vice idea, I was going to bolt one on the table but I was afraid it would get in the way. I think I like your idea better. I will add a couple pics when I get a chance to get it finished up hopefully by the weekend. Get the cheapest oil you can find, used car oil will work on this application. Put some on a rag and wipe it down after it is made and do it again every once in a while or any time you start seeing rust. Even my tables inside need oiling a couple times a year. Yes sir I bolt them. When drilling I just make sure it is flush with one outside square edge. As for the casters there are a few ways to make locks or chocks for them that is not to difficult ...good luck with your build. My oldest son and I built mine about 10 years ago. Mine is stationary, no casters and we built it with the idea that the stick welder would sit under it and mig cart would be to the side. The leads on my stick welder are 40' so I welded these really cool hooks on the legs to hang my leads on. Right in the front where they were easy to get to. I was so proud of myself, this thing looked sweet. 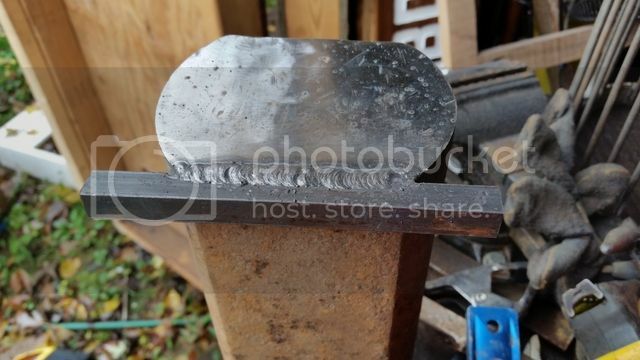 About a month later I was using my cutting torch, I don't remember what I was cutting, but when I lifted my shield, my stick welder leads were on fire. DOH! 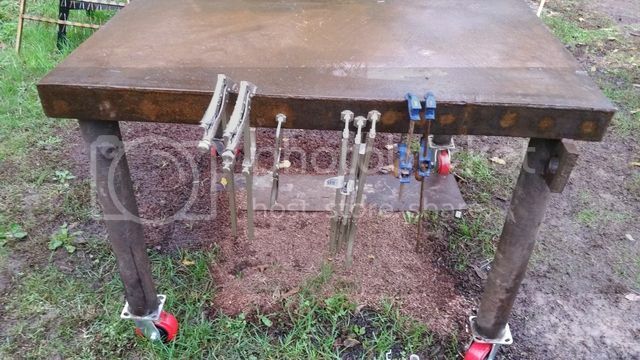 My legs are recessed under the edge a few inches, but the hooks I put on the front allowed my leads to be almost even with the front edge of the table and slag from the torch was landing on them. Fortunately my leads were very old and cracked and in need of being replaced anyway. The new leads have been relocated to the inside edge of the rear legs. 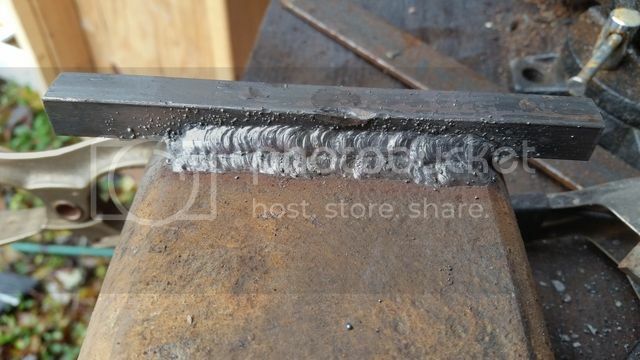 Use expanded metal instead of wood for the shelf with supports as needed. Bottom shelves have a tendency to fill up with grinding and other dust. 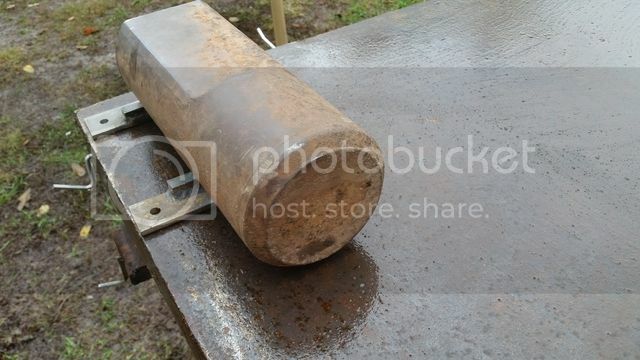 I was looking for a decent anvil, but most of the ones I could find were cheap cast iron and I was afraid it would bust too easily. Then I remembered that my dad had some hammer heads that come from a limestone mine close to where we live. Mighty fine work Brother I like the anvil it will come in handy. I believe you'll appreciate having a clean table top for those times when you're sliding large material around. I too was going to hard mount my vise until Kevin suggested using the receiver hitch. Best idea ever!!!! Here is mine. I got two receivers on my table now. One is a bench grinder and the other a vice. I am going to put a third on for a lamp. The great thing is that they can be moved to different locations and positions. I still got to put some power to it and casters. If I just install the casters the height will be too high. The magnet that comes from HF is for the MIG holder.